This week, 6 old researchers guided the class instead of Lee as the co-midwife tp listen to each other and support each other for the birth of novel subbody=cobody. In the Subbody Butoh, there is no teacher, no students, but midwife to listen to the subtle breath of subbody=cobody and support the safe birth, to open infinite creativity of Life. It is the process to transform to Rhizome which can connect freely and separate flexiblly beyond all kinds of borders. Rhizome is a sprout form of future of human without any Hierarchical Tree order that was found by a philosopher, Gilles Deleuze (1967). This pics (Total 18) are in the Adam's guide of his "Fashion Butoh Exercise". Please crick the picture above to see all pictures. Yesterday evening, there was held the Subbody-cobody theater. 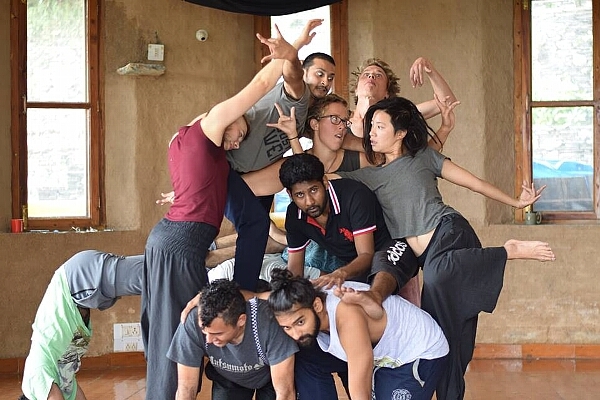 In spite of middle of monsoon, it was full of deep performances, by the old and new students; Gorka, Pamela, Adam, Rita, and new participants of Adam's class. 5 million views on YouTube! Yesterday, we dance in the mountain in France near Geneva, and all activities of Eurasia tour has finished. We got so rich harvest, new Qualia, new methods, new resonance pattern. I have experiments of new methods; Dreaming Share and Resonant Rhizome, listen-move-Listen and so on in various conditions. We could deepen it a lot. Thank you, all organizers and participants! Next year, now Pamela and Robert prepares USA-Mexico Resonant Butoh tour 2018. After next year, we will back to Eurasia tour 2019. The Russina workshop has been canceled by visa issue, but, we will realize it after next year. If someone wants to organize it, please inform us. 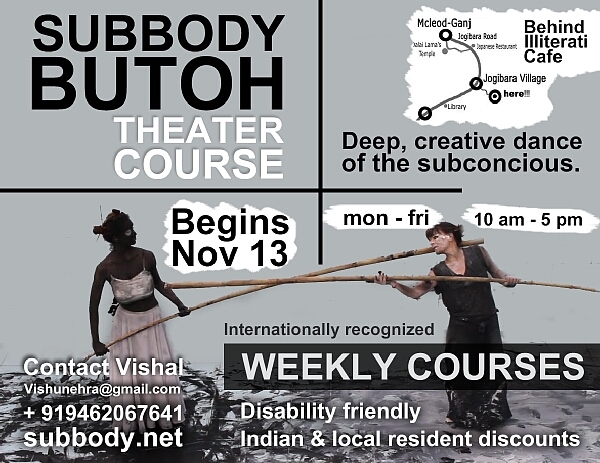 Wheelchair Butoh in Hungary entitled "Beyond the Boundary" is the third time this year. The title came from the word that a wheelchair person said in the first year, ”We have been treated in two ways. One is as useless children, the other is another is as an object of nursingcare. But to be able to dance together beyond the boundaries is the happiest experience. " Yes, We will continue dancing, until every boundary disappears from the earth. Read more "Darkness of body"
Ma Dar(Dara) guided Subtle Qulaia Listening at the Wheelchair Butoh workshop in Hungary. She used a paper with chaniging the shape and how to listen to the subtle Qualia with handicapped participants. Participants was fascinated so earnestly to listen to the physical and memorial Qualia of the paper. It was so beautiful Resonance that everybody became One as Life. In the past she was working to care of disabled people. That experience was fully made use of. This is the Origin of Ma Dar's midwife. I did not understand the Hungarian words, but the Qualia that she guided was so rich and various transformations. After using paper, she guided to listen to subtle invisible Qualia without paper. This was the 3rd day, on the 4th day, she continued it with using each one's favorite things, it lead each one's so intimate forgotten memories with favourite book or doll and so on. And 5th day was with water bag. In the guiding the last performance, she guided a walk with resonating each one's water Qualia. The Qualia of water is so deep as the bottomeless. It was also so interesting diverse walk. She finally guided the whole last performance at the musium. Lee could just watching the process that a new midwife was born. I was just surprising at the so fast growing of her. Next year, Robert and Pamela are preparing the USA and Mexico Resonant Butoh tour. Then Lee will not able to come Hungary, but instead of me, Dar will hold the Wheelchair Butoh workshop as a midwife. It is pleasure what beautiful resonance will emergence. A week after I heard the death of Romez, I danced Romez at the Forest Park in Rotterdam. A lot of memories overflowed over 20 years spent with Romez. Among them, in the desert of Rajasthan, the bodily sensation of Romes at the moment when sudden cerebral hemorrhage occurred came to my body. How many times have I danced the dead? Through dancing the dead and I will be one. The darkness of my body is full of the dead. It's as if they are playgrounds. Little by little, it gradually approaches the country of the dead. butoh impro from john giskes on Vimeo. The Eurasia Resonant Butoh Tour 2017 has begun at Rotterdam, Netherlands. We started it from Listening. Listning to the subtle invisible Qualia in the darkness of body. Listen, and if you catch subtle tendency at a part of body, move with following the tendency, and listen to subtle Life Resonance Qualia again. During dancing, keep listening constantly. When we concentare on the listening, it is so beautiful. Why the listening is connect with the beauty. able to lead the audience to the listening itself. We don't know what are we listening, We cannot explain it by word what are we listening. The Life Resonance Qualia are invisible and so subtle. The way you listen to something you can not see is perhaps human beings take off human clothes and listen carefully to their lives. It is listening to the mystery of life and the awe. Dancer's listening is able to involve others into the listening to the Life Resonance. It is beautiful.